Created a Greasemonkey Userscript ( Craigslist Car and motorcycle import cost to Canada ) for any Canadian shopping for car on US Craigslist site. 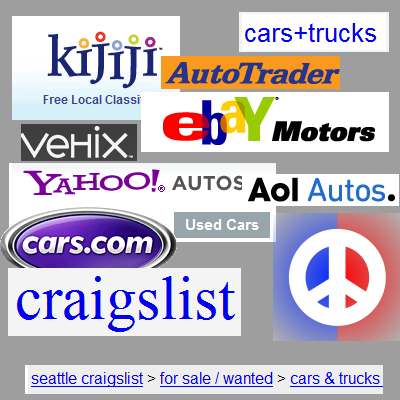 This is for any Canadian who is looking to buy car or motorcycle from US Craigslist site and import it. It gives approximate overall cost of vehicle in Canadian amount. If you find this helpful at all then please write a Review. 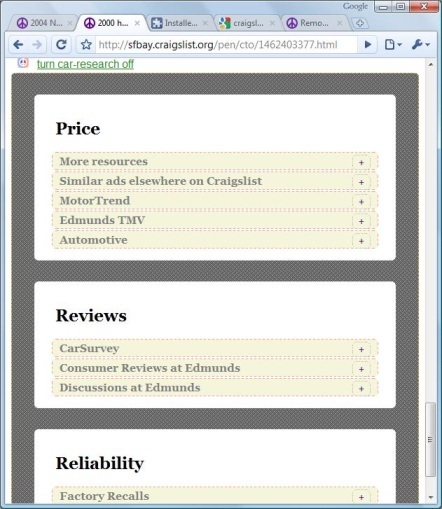 Craigslist car research extension is now available as a Firefox Addon, Greasemonkey userscript and Google Chrome extension. Pretty useful for anyone looking for a car. 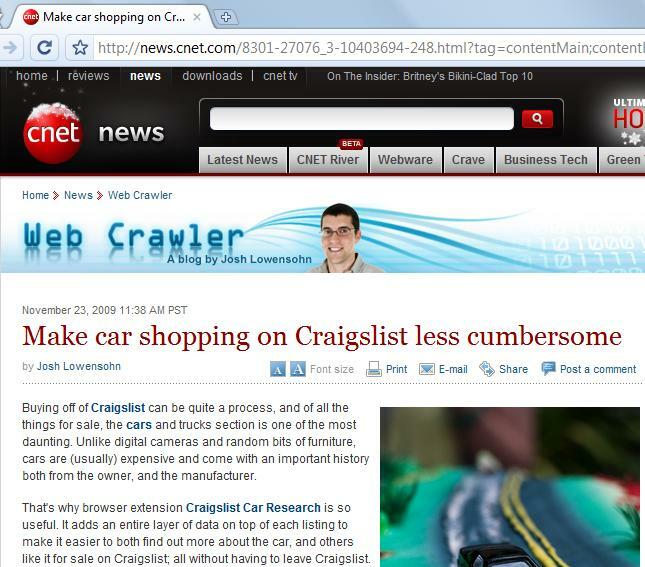 The Google Chrome version of Craigslist Car extension was one of the top 50 featured extension on the launch of Google Chrome Extension Gallery. 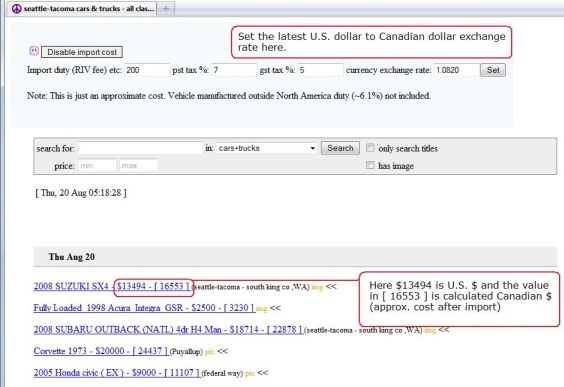 Also created a related userscript that gives estimated cost of Importing US car or motorcycle to Canada. Now this mashup is heavy but adding the enable/disable feature buttons is handy to manage the clutter and speedup browser load. 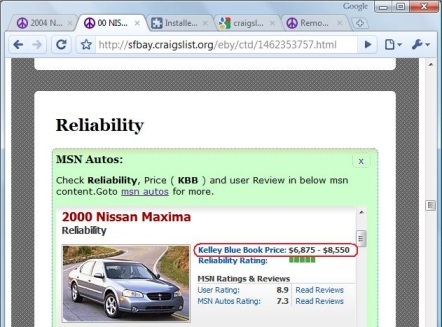 If the listing is in correct format then it will get that car’s model’s information from sites like MSN Autos, Edmunds.com, Automotive.com, motortrend.com, etc. 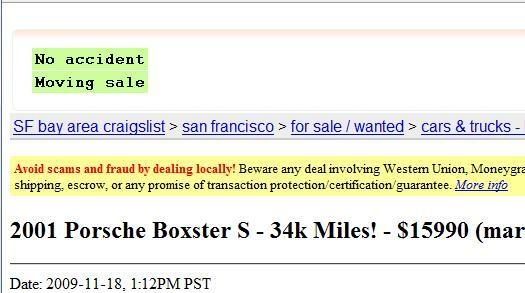 If there is a phone number in the post then it makes it easy to do a search of the phone number on Craigslist to find out if the ad poster has posted any other ads. This sometimes help in determining if its moving sale or a ad by a reseller etc. 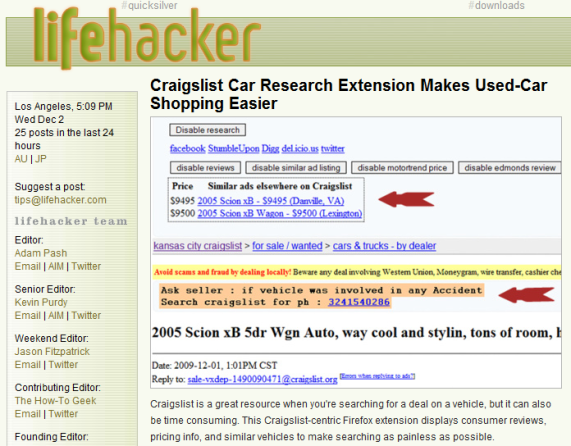 Now the extension also works on Cars.com, AOL autos, Vehix, freebo.com and pickuptrucks.com. Now the extension works on eBay motors (US) and Yahoo Autos also. Makes it easy to do search on VIN number. Now it works on Kijiji (US) too beside Craigslist. Lists similar matches from Yahoo Autos, Oodle. This gives idea of pricing and availability. Now it lets user specify ‘Year’ or ‘Model’ if either one is missing or is not recognized from the listing title. Fixed ‘turn car-research On’ link. Added reviews from ReviewCentre?. This is experimental for now as sometimes it returns wrong results. Added Epinion reviews. This is also experimental feature as it sometimes fail to work in Google Chrome. Added AboutAutomobile? TSB (Technical Service Bulletin). Added Google Videos of relevant car. Clicking on main category blocks (Price, Reviews, Reliability) toggles subcategory blocks. 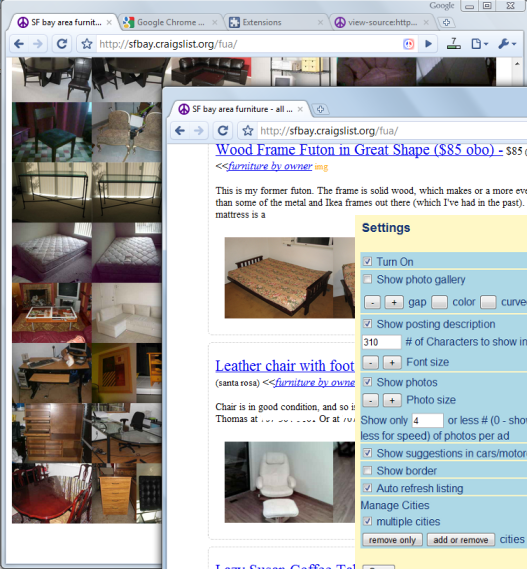 Added icon to suggestion box at top, to indicate that its part of extension and not from craigslist. Minor changes to color scheme. created main category blocks Price, Reviews, Reliability. moved some of the features from top of page to bottom so that the screen looks more clean and less busy. added +/x buttons to enable/disable features. Removed old enable/disable buttons from top. added background to indicate this is separate content then the original craigslist post. 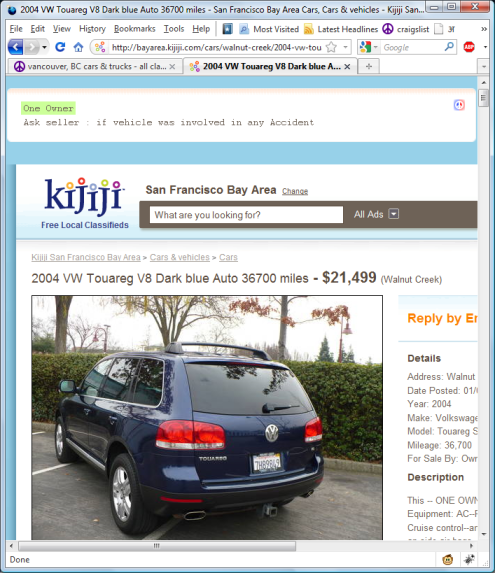 changed the search engine for finding Similar car ads on craigslist. Now it returns more recent listings. web annotations links (twitter, facebook,..) feature is removed for now. re-designed the car-research on/off button and functionality. now ‘Home of this utility (feedback)’ is minimized at first run. Fixed Enable/Disable buttons. They were not working properly in Firefox 3.6b1pre and Minefield 3.7a1pre. Fixed code. 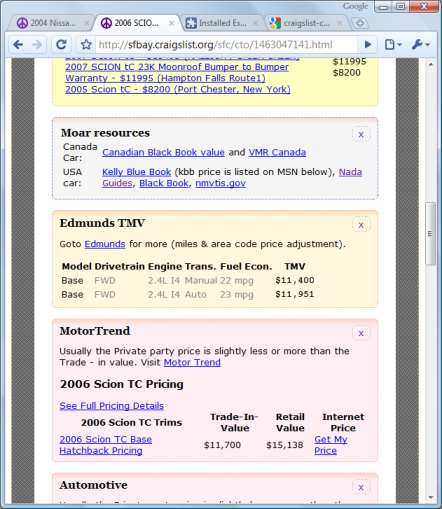 Now Edmunds (discussion/reviews), Motortrend pricing, etc are working in Firefox 3.6b1pre and Minefield 3.7a1pre also. Cosmetic change to the bottom block (‘Home of this utility’ block). 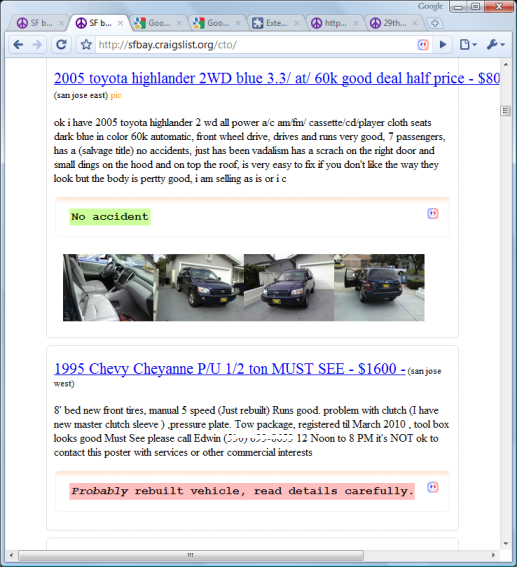 Added a feature that makes it easier to search all craigslist for other ads posted by the poster. Basically searches craigslist for matching phone number listed in the ad. 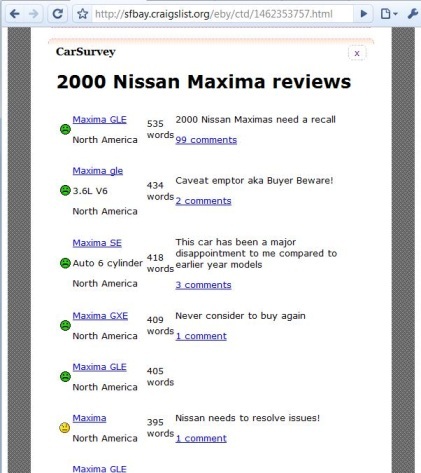 Added a new firefox extension “Car reviews etc“. Its a port of the above extension and works on any webpage not just craigslist. Its a strip down version of above extension and works by selecting text (in format “year model”, e.g. “2007 civic” or “2006 toyota camry”) on webpage and right-click to get context-menu. From context-menu select “car reviews etc”. This will show reviews, pricing, recall info etc. Odometer reading: Include odometer reading total ~ km’s or miles. Pictures: Include pictures of the car. Pictures can save lot of time from unnecessary communication. Craigslist listing/search has an option to filter out ads without pictures and lot of buyers do use it. If you have customized car then post pictures showing the customized part. If the car has been in a (minor) accident or fender-bender then post pictures of before and after repair. This might get buyers interested into the car who would otherwise get spooked by mere mention of accident / claims. Car history report: If you know that the car has clean title then spend $50 and obtain a car history report from services like Car Fax reports or Car Proof. Mention in your car ad that the history report is available for the buyer to view. Also giving out VIN# in email to the prospective buyer should be fine. Contact information: Preferably provide both email and phone number in the ad or atleast email. 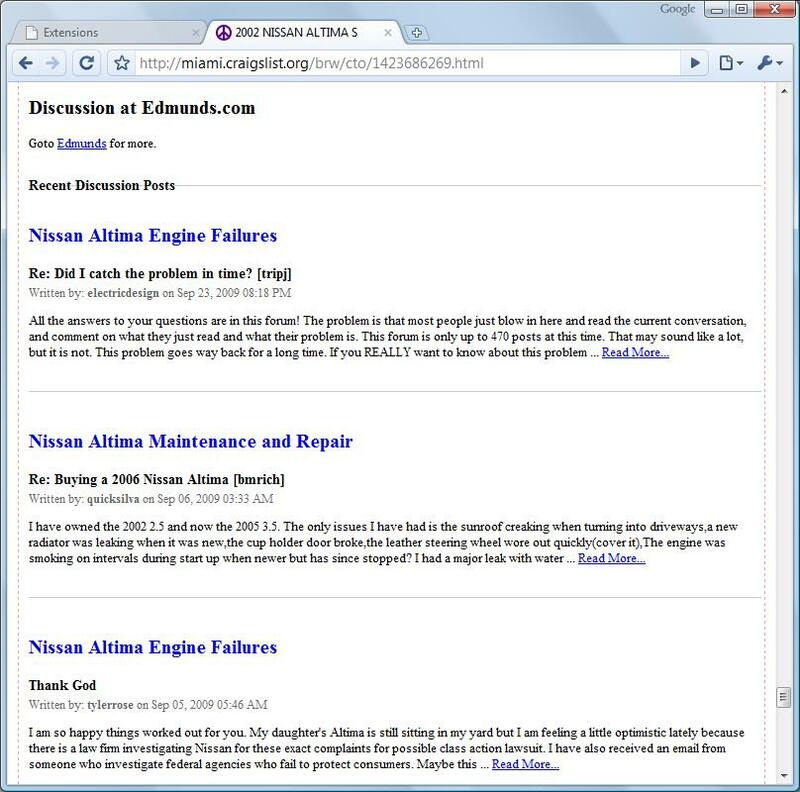 If using craigslist site then use there anonymized email.